Knot Just Macrame by Sherri Stokey: Fall is in the Air and in the Macrame! With Labor Day in the rear view mirror, it's becoming glaringly apparent that Fall is upon us. I have a love/hate relationship with Autumn, only because it signals the end to my beloved Summer and the transition into the Dreaded Winter. For me, the phase "winter is coming" has brought a sense of impending doom much longer than the Game of Thrones business has been around. It really isn't Autumn's fault, though, so I try to enjoy it as much as I can. I do like the cooler nights when I can sleep with my windows open and I like apples and pumpkins and all those fall-ish things. 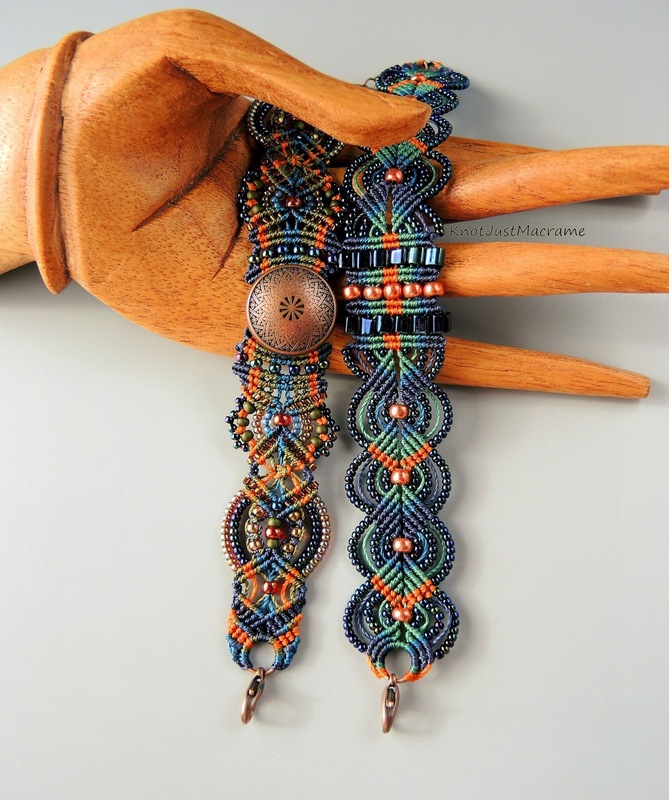 Lately I've been playing around with a autumnal color palette of blue, green and copper. A customer requested this bracelet with a TierraCast button, and I think it turned out very well. She loved the bracelet, but I wasn't ready to let go of the palette yet. Or the orange. For some reason, these colors together make me feel warm and fuzzy. An amazing combination of colors, they are beautiful. Do you sell patterns? Would love to learn such beautiful designs. Fall is my favorite and I just love one of a kind pieces. I have small wrists and need to measure as I work to fit how I like. Really love the colors on these. Your work is amazing.